Patricia Jane Monte-Roberts, from the USA, has sent us this interesting story of a tragedy with Wolverhampton connections. My great-grandmother, Annie Evans-James, came from Wolverhampton. Her parents Edward George Evans and Ellen Painter-Evans lived at 2 Bradshaw Street. She married Ernest James and had two children Ada James-Verrill (my grandmother) and an infant son. In July 1912, Annie and her baby son and daughter Ada were travelling by train to West Hartlepool where they lived, after visiting her family in Wolverhampton. While leaning against the train compartment door, she fell out of the train with her infant son in her arms. Luckily another passenger grabbed Ada and stopped her from falling out as well. Unfortunately, my great-grandmother Annie and her baby were both killed. When they entered the next station, the station master and his wife looked after my grandmother over night, and her family in West Hartlepool were notified of the tragic accident. My grandmother Ada was then raised by her father's parents. My mother remembers Ada's father (Annie's husband); they called him "Red Grandpa" because of his red hair. Mom recalls that he liked to drink and played the horses. My grandmother never knew her mother's family in Wolverhampton. For some reason it was not discussed, and none of the Evan's family from Wolverhampton ever made any attempt to contact her. We know nothing about Annie Evan's family from Wolverhampton. 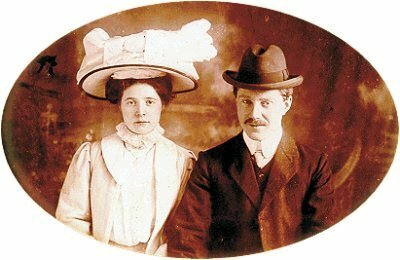 I do not know the names of my great-great grandparents. I do not even know if Annie had any brothers or sisters. 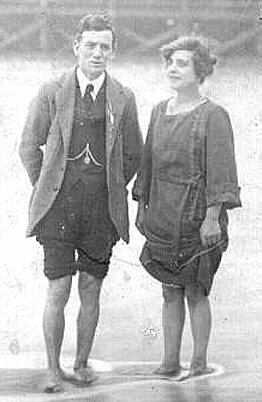 Annie and her brother-in-law Arthur James. The Evening Telegraph and Post, 22nd July, 1912. The Evening Telegraph and Post, 23rd July, 1912.